The CRE industry is morphing into a service-based industry where the traditional notions of public and private space are now eroding. As a result, flexible workspaces will be in high demand. Research reveals that, by 2030, 30% of corporate office footprints will consist of flexible space and, in 2022, there will be more than 30,000 coworking spaces. So, landlords need to change their mindset and embrace flexible spaces, or risk losing their best tenants to the competition. One concept that’s gathering pace to address these changes and challenges is the Space-as-a-Service model. Here, landlords can rent out their square footage for flexible working initiatives. One of the most prevalent examples of this in the real estate industry is the behemoth coworking operator, WeWork. However, such operators usually require a sizable space (of the order of 25,000 to 40,000 square foot) and provide homogeneous designs and solutions. If you have a smaller footprint or want to do something a little different with your space, you may assume you have to go it alone and open your own flexible workspace business. And that can be a risky strategy – only 40% of dedicated coworking spaces are profitable. This is where the small-scale Space-as-a-Service providers step in to address this gap in the market. For example, Space-as-a-Service operator Bold transforms spaces that are between 5,000 and 15,000 square foot. A shared Space-as-a-Service model addresses all these concerns and, for landlords, you don’t have to give up tens of thousands of square footage to set up your flexible space. You could simply convert one floor or small area in your office into a flexible workspace. Getting more for less? This almost sounds too good to be true. But it does make sense. 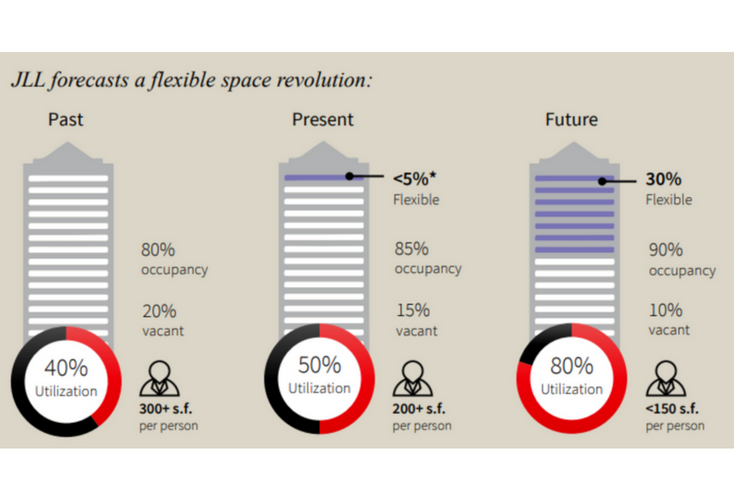 Let’s explain using figures from JLL’s 2017 report Bracing for the flexible space revolution. JLL predicts that 30% of commercial real estate could become flexible, helping to maximise utilisation and reduce under-occupancy. In the past, office spaces were divided into desk space, offices, meeting spaces and other amenities (such as a lunch room, server room etc). However, private spaces such as meeting rooms and offices would often sit empty. The Space-as-a-Service model makes the most of the space available: the landlord can add a flexspace amenity to a building where, for example, a tenant could rent a meeting room or hot desk on an ad hoc basis. “This is the best of both worlds for the tenant and the landlord. Tenants reduce their footprint but still get access to a flexible workspace. The landlord will attract and retain their best tenants by providing them with a model where they can accommodate variable demand and shrink their fixed costs,” Parker added. 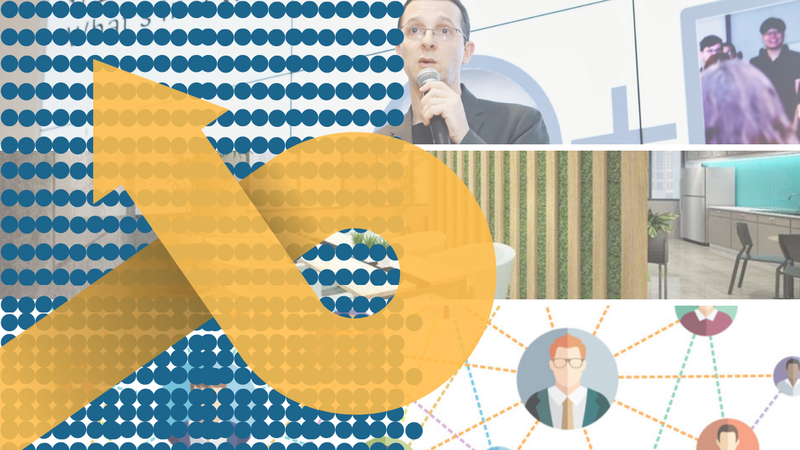 While flexible working has seen massive growth in recent times, coworking for enterprises is just starting to take off. 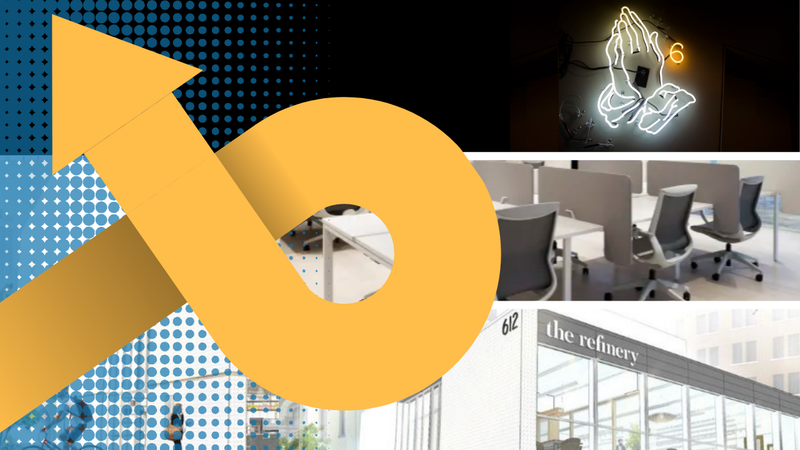 While some businesses are opening their own version of coworking spaces to foster innovation, the Space-as-a-Service model could be extended to provide these corporations with in-house flexible amenities. “We’re seeing increasing demand from growing and established organisations to create a fully managed, creative and flexible workspace. 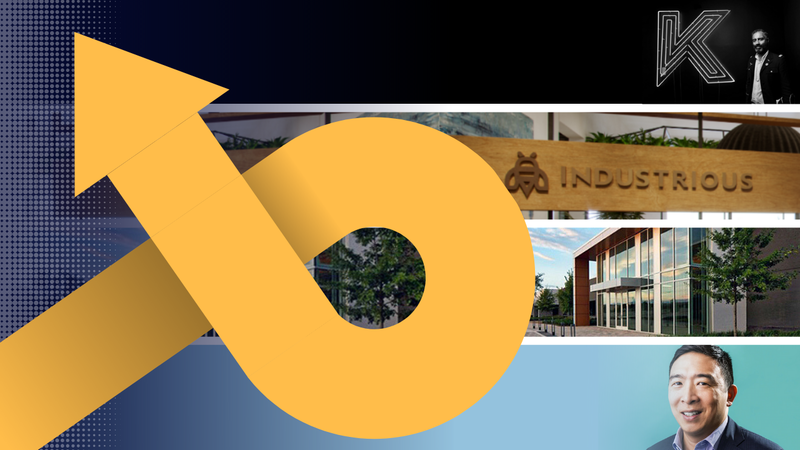 I expect to see tremendous growth in this area where Bold’s Space-as-a-Service platform provides a turnkey solution to these businesses,” Parker said. 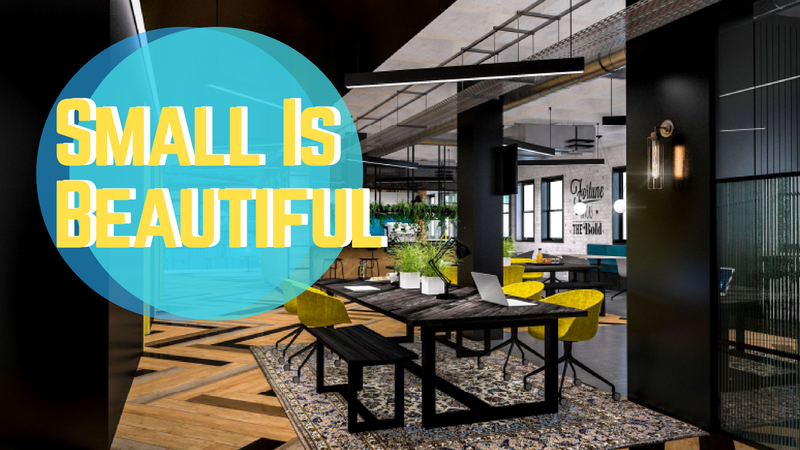 It’s an attractive option from a financial perspective too, as coworking corporations benefit from average savings of 25% compared to a traditional office lease, according to a recent report by Colliers International. Partnering with a Space-as-a-Service provider gives landlords greater choice over the design of their space. For example, at Bold, their interior design team decorates each space in one of their Bold themes. These themes are designed specifically to inspire creativity and collaboration. Each theme incorporates lots of colours and patterns and they work with landlords to shape the feel and identity of each space within these themes. A Bold footprint incorporates a mix of private spaces, a drop-in area for flexible working and a cafe serving strong Bold coffee. The size of your footprint can scale up and down to match your asset – the choice is yours. And this inherent choice is what sets apart Space-as-a-Service providers apart from the WeWorks of this world. It’s the start of a David versus Goliath battle and, ultimately, the tailored and flexible approach of small-scale operators could chip away at the dominance of the major, incumbent Space-as-a-Service players. “I ​think there will be a number of large international operators in the future, but there will be plenty of space for smaller, niche or specialised operators and a number of flexible workspace business models serving all types of businesses,” Mucelli concluded. The times are certainly changing and the Space-as-a-Service model does bring the inherent flexibility that landlords and tenants demand. While there can be no doubt that Space-as-a-Service will break into the mainstream in the CRE industry, it will be interesting to see exactly how this model adapts with the changing world of work.